The very fact that I have purchased from Cable Chick so many times is living testament to how highly I consider your company. Your product line, speed and efficiency of delivery and friendly service are all very much appreciated. The occasional surprise like the minties is awesome as well. This tablet sleeve is like a trendy, stretch-fit cardigan, except that it protects your pride and joy from incidental scratches and abrasions when travelling. It also makes a handy surface to place it on when the nearest table top is dirty! 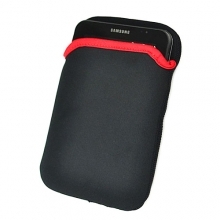 Designed to protect your Tablet when it has to go into bags, backpacks, glove boxes or any place where it might come into contact with scratchy things like keys, it completely encloses your device so nothing to get in and attack the screen. With an elastic overlapping flap, it would take a sandstorm to get past these defences! It's constructed from tough neoprene with sewn edges all the way around, and can easily accommodate all 7" tablets including the iPad Mini at 135mm x 200mm (with some extra stretch for slightly larger brands. All in all, it's the perfect casual soft cover for your Tablet! Cable Chick 12 Month Warranty!